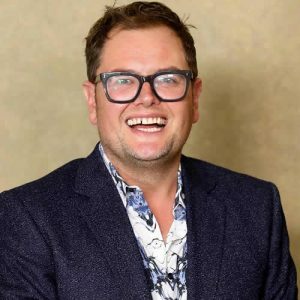 Alan Carr, born 14 June 1976, is an openly gay English stand-up comedian and TV presenter, renowned for his camp demeanour and saucy innuendo-based jokes. Carr made his television debut as a guest on the ITV1 lunchtime show Today with Des and Mel. He regularly co-presents Channel 4’s The Friday Night Project (alongside Justin Lee Collins), has appeared for a week on Countdown’s dictionary corner, and has made regular appearances on game shows such as FAQ U and 8 Out of 10 Cats. He has also performed in the Royal Variety Performance. He won the New Comedian of the Year Award at the 2001 BBC New Comedy Awards and in 2005 was named Best Stand up comedian in the North West at the North West Comedy Awards. Alan Carr won the Best Comedy Entertainment Personality award. He co-presented Channel 4’s The Friday Night Project with Justin Lee Collins, which in 2008 became The Sunday Night Project.